Ulala changes outfits every level to keep things fresh. Finally, Space Channel 5 has a lot of cool little touches that I appreciated. For example, completing the game once opens the Extra Mode, which will allow you to take different paths through the game the next time you play. This increases the replay value a bit over other rhythm-based games, and gives you something to look forward to after the initial run-through. Another nice touch is that every character you rescue has its own associated biography, which can be viewed from the options screen. Some of these are hilarious, in that unique way that only precisely-translated Japanese can. For example, take "Sport" Logan, a Spaceport 9 worker whom you rescue in the first level. We are informed that his favorite color is "Russet" and that he "... is a jolly man who works at the Spaceport during the day, and fights crime in the evenings. He enjoys backgammon." The game is full of stuff like this. Priceless. 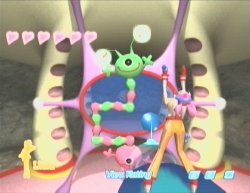 The number one problem people might have with Space Channel 5 is that there may not be enough gameplay to satisfy some. First, the play mechanics are extremely simple -- perhaps too simple. While it's true that this is by design, some players may be rather non-plussed with the game's simplistic button-pushing nature. Second, the game is noticeably short. With only four stages, a good player can go from start to finish in well under an hour. While the alternate paths and the desire to rescue every character will keep you playing, it's possible that you'll have seen most of what the game has to offer in the space of a few hours. The boss of the third report: the terrifying Morolian Monroe. view of the characters will remain the same for an instant. This looks rather odd, especially when the camera is cutting between angles rapidly. It's not a major problem, but I'm surprised they couldn't get these timing issues worked out before shipping. Another video-related problem is that at a few points, particularly near the end, FMV compression artifacts become quite noticeable. Again, this isn't going to kill your enjoyment of the title, but those of you with sharp eyes will be noticing some dirty, JPEGgy badness from time to time. Finally, some niggles. It's way too easy to overwrite a saved game, as a single button press will do the deed. The game could have at least added a yes/no prompt to make things a bit safer. Better yet, it could have remembered which save file was in use and kept the cursor highlighting it, ensuring that you wouldn't accidentally overwrite the wrong file. Secondly, where the heck is the two player mode? This game is bursting with possibilities for fun competitive play, but no such modes are offered. A pity. Space Channel 5 takes an existing genre and infuses it with astoundingly fresh settings, characters, and music. The end result is a work of art in every sense of the word. Still, the rigid gameplay will not appeal to everyone, nor those who dislike things that are outside the norm. 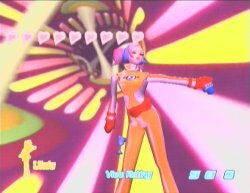 But for the rest of us, Space Channel 5 is an absolute blast, and a testament to the immense talent that's resident at Sega. If you're in the mood for something different, pick up Space Channel 5, and get down with your bad self. Highs: Superb soundtrack, amazing production and character design, smooth animation, just plain funky. Lows: Some compression artifacts, may be too simple, no two player mode. Other: 1 Player, VMU Compatible (5 blocks), Arcade Stick Compatible, VGA Cord Compatible.